Were there any foods that you didn’t like or refused to eat as a child? Any vegetables you didn’t care for or did you ever have a teenage stint at vegetarianism? As a child I pretty much ate and liked every kind of vegetable. I loved eggplants and cauliflower in particular, vegetables that many children refuse to eat. One thing I had an issue with, and still do now, is the dark meat from the chicken and ground meat. I really detested drum sticks and for some reason, that is always the piece my mum gave me! My father preferred the white meat so he was automatically given most of it and the rest divided amongst the children. Since I was always stuck with the drumstick and I hated it, I just started declining the chicken altogether. The whole dislike of the ground meat/mince is a texture thing. I just don’t like the texture of any thing that has ground meat. I was like this as a child, too and this one I didn’t grow out of. I particularly disliked a ground lamb and spinach curry my mother used to make. I found it quite awful and that dinner time seemed to me to last an eternity. It came to the point that it was being made every week, sometimes twice and I couldn’t tolerate it! Those were the evenings when the extra biscuits and crisps came out! These days I’m not so picky about dark meat and can eat legs and thighs off the grill and roasted, I still have a hard time eating a curry with legs and thighs! As for the ground meat, that is very much still an aversion I can’t get around. I don’t like spaghetti with meat sauce; I always make meatballs. I don’t use ground beef for chilli; I use shredded beef. I make lasagne but rarely eat it. I make very few ground meat curries, they are very good and easy and my family likes them just fine, it’s just me. The ground meat has to shaped before I can eat it like in kebabs, hamburgers and meatballs. It’s a strange thing for an adult I think but I must’ve had a bad experience as child for it to be such a recurring issue for me. This Kheema Aloo curry (kheema is ground meat and aloo is potatoes in Urdu) is very good and even though I don’t cook it often, I do try a little bit when I cook it for the family. It’s easy to throw together, very versatile because you can use any ground meat; chicken, beef or lamb and you can add other vegetables. Serve it with a side of basmati rice or some naan or pita bread. I prefer it with bread over rice. A curry made with ground beef, lamb or chicken and potatoes. In a large skillet/fry pan, heat the oil on medium high heat and add the onions. Slowly brown the onions until golden and caramelised. Add the garlic and ginger and cook for a minute until fragrant. Add the turmeric, cumin, coriander and the garam masala if using, and cook a minute until fragrant. Add the ground meat and break up with the back of the spoon. Add the red cayenne powder and mix. When the meat is no longer pink, add the potatoes. I use parboiled potatoes because at my altitude, they take forever to cook in a curry. If you are concerned about the potatoes not cooking through, parboil them while your onions are browning. I also like to parboil them so that way I don't have to add too much water to the meat. If you are using parboiled potatoes, add the ½ cup water to the pan and cover and allow the potatoes to cook all the way through. Uncover when they are almost soft to allow the curry to dry out a bit by evaporating some of the water. Add the green chilli and fenugreek leaves at this time, crushing them in your palms as you add them. You may need to add more water if the potatoes don't cook all the way through. Check the consistency of the curry, if you prefer slightly loose curry then don't dry out all the water. If you prefer a drier curry, then keep cooking until most of the water is gone. Garnish with cilantro, check for salt and pepper. The fenugreek is optional but it adds a wonderful taste and I love adding it to this curry. 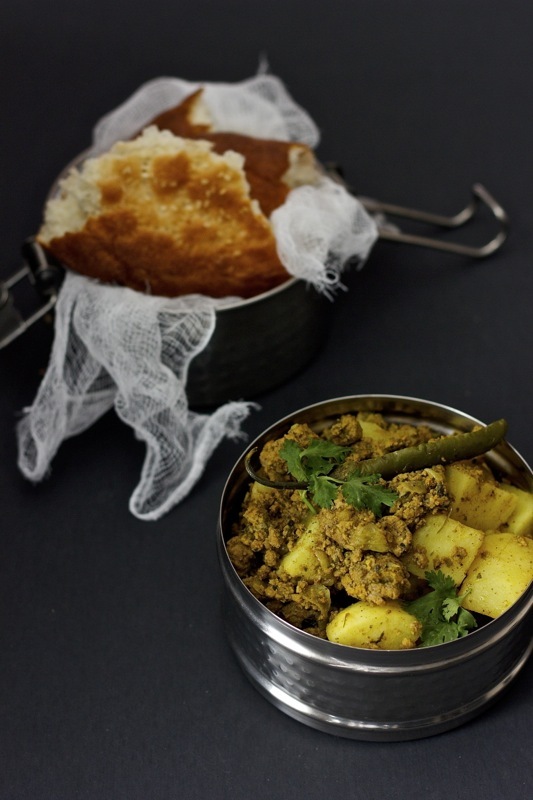 One of my favourite dishes is made with meat, fresh fenugreek leaves and potatoes. When I can't find fresh, the dry is quite potent in a pinch. It adds a pleasant, slightly bitter taste and it complements the meat and potatoes perfectly. So, your turn! Do you guys have any funny food aversions or something you just can’t stomach? Hope your week is off to a great start. I’ve had sick children and husband last week and the ones who weren’t sick last week are sick this week. It’s cold and wet this week but we’ve had the fire going and everything is fine when the fire is roaring, crackling and popping. Have a great week! I didn’t have green chili, but the recipe turned out great anyway, and was so easy to make! Definitely will make it again. Thank you! I am so glad Joyce! Thank you for trying it out and thank you so much for coming back to comment. I appreciate it! I am so craving Kheema right now. This looks fantastic! I did, always tried to hand off that drumstick. I would groan as I saw my mother dishing out the food and there was that dang drumstick headed my way. ugh.I too do not like liver and won’t eat it any which way! Cauliflower and Brussels sprouts I love! So do my kids so that helps! Have a super weekend Bam! Nazneen-first of all I apologize for stopping by late to comment on this dish which I happen to love. The combination of kheema and roti, oh wow. Looks yummy. I really like the lunch box you’ve used for the pictures, a great idea which I’ve been plotting for a while now.. I think it is the gristly bits that put me off as a youngster and I just got frightened it would always be like that.I am border line on the burger, once again its to do with fatty meat and gristle. Mr Glam sounds like my brother in law! You’re such a weird kid! Liking vegetables but hating chicken drumsticks! That said, as a kid, I liked my veggies too- which is pretty unusual. Maybe it’s an asian thing; our mums are just much better at making veggies taste great instead of leaving it to be a side salad sort of thing. shuhan recently posted..The Plusixfive Cookbook– YES! OUT NOW! Well, i still don’t like dark meat. And I don’t like food with bones in it. Oysters, not for me. Other than that, I’m pretty good, I think! But ground meat-do you eat burgers? This curry looks great. But everything you make looks great! You’re like my bro in law! he doesn’t like meat with bones! I will eat burgers because they’re formed but I do so reluctantly! With burgers, it’s more to do with gristle and fat…eeeew!Thanks Abbe, we need to get together soon. I’m waiting for my brothers visit to pass and then maybe I’ll plan something. Maybe you could substitute shredded meat for ground in your spaghetti with meat sauce. The meat adds so much flavor! Anyway, I’m sure I made my mom’s life miserable when I was a kid, although now I eat almost everything. And I’d definitely eat this! I’ve not made this dish before, but have had it several times in restaurants – it’s terrific! And your version looks especially nice. Thanks so much. hey, thats a good idea with the shredded meat for the spaghetti sauce. I don’t make it very often because my children prefer marinara to meat sauce so it saves me trouble any way! This is one of the easiest curries John, make it at home! Don’t need it order it outside. I made my mother’s life miserable when it came to eating food…I was one hell of a picky eater. Now, looking back at those time, I can’t believe it was me! I eat practically everything now! Wow, looks delicious, i guess eating this with crispy tortilla will be a heavently pairing! Thank you Dedy! Crispy tortilla would be quite good, but naan is excellent too! Thank you for your comment! Not meat but I never liked leafy greens as a child, now I love and can even have them in smoothies. I love your ground meat potato dish which I usually make with peas or peppers and with chicken. I didn’t mind greens back then but oh my, sometimes I have a very hard time now!Its the texture thing again! Smoothies would be ok and my daughter makes me kale and spinach smoothies and I can tolerate those. I love the peas and peppers in one too! Those are probably my favourite and I will eat a little then. Oh gosh – reading this made me smile. I had plenty of food aversions as a child. I was/am a picky eater but much, much improved. I hated celery and I’m still not a big fan though I like it cooked down in a soup. I still don’t like cilantro but I like scallions and parsley now. The list goes on and on! I do adore dark meat and ground meat is not a problem. I guess we all have our own quirks. : ) I would have no problems enjoying this delicious curry for you! It’s been really interesting reading everyones dislikes! Things I never though they wouldn’t like! I’m glad I asked the question. I wonder what would happen if I invited everyone for dinner one day….we’d all have to bring our own food :)!! My #2 daughter heated bananas and tomatoes! Once my brother was visiting and my nephews and they all offered her money to eat a banana. So each person was offering $10 and it was totaling around 30-40 dollars. Yeah, it took her 30 minutes but she ate a banana! I love keema aloo especially my Mum’s dish. Looking at this I am missing it all the more. I cook with mince all the time but less of curries and more of pies and stuffings…that is because my kids are not very tolerant to spices yet. Not that they don’t like it…they do, but are unable to digest them. I hope that changes soon. Your’s look mouthwatering delicious Nazneen! As a child I ate everything…actually liked everything and the amazing thing is that both my boys do too. People refuse to believe me but it is true..I am fortunate to have not encountered food battles at home. I think kids will eat everything, and we as parents fuss too much. Spices I understand and that takes some time to tolerate, but if you cook and tell them thats what for dinner, they eat it. I never took a no from my children and they do not fuss over food at all. In fact, they are more adventurous than me. Good that we have flood insurance. I just flooded my space with saliva. This looks divine, and I wish I lived next door so that I could sneak in and steal the entire container and not share even a spoon. OK, so maybe when you make it with mutton keema, I will, lol!! Yummm!! Thank you Anne. I have heard about the generation of canned food! I hope you are enjoying plenty of fresh vegetables now!! So comforting! Especially with the current cold and wet weather. Stay warm! Thanks Kiran, yes its nice to have these warming spices during these chilly nights. Nazneen – this sounds really wonderful: the perfect comfort food for these progressively chilly nights. The spices combined with the potatoes is a great combination, and I don’t mind the ground meat. hanks fro sharing this, even if it isn’t your favorite! Thanks David! I love the flavors of this dish, I just don’t like the texture!! I try and clump the meat so it’s not too separated! Your photos of this dish are beautiful Nazneen. I’m such a curry fan that I must give this a try soon. Pinned. I’m lucky that I grew up loving all vegetables, except for the stewed tomatoes at the school lunches. Thank You Lea Ann! I don’t like chunks of tomatoes in my food! This recipe is very easy, I hope you try it! I’m not a fan of pork (unless it’s super finely sliced or minced! ), and find offal quite difficult, but that’s it. I’ll eat any veg that’s put in front of me, and any meat or seafood. How beautiful that you have an open fire! I used to have one in my bedroom and absolutely adored it, especially the popping noises! I haven’t even attempted to try offal!! I don’t like mince, how do you think I’ll handle offal :)? I think your very adventurous, I see all your posts with unique dishes, I’d never have the nerve to try half those things! You must have guessed I have mince in the fridge! The one thing I can’t eat is soggy bread, so, no bread and butter puddings or summer berry puddings for me. Hahaha! Soggy bread? So you don’t like bread puddings? I love bread pudding! Its funny how different things affect us all. wow flavour explosion!! Love it! There wasn’t much I wouldn’t eat as a child. I was probably a dream for my mum! Thanks Lisa! Do you eat everything now? Let me get that knife out of your heart, John! I do make spaghetti sauce with meat and try and leave the pieces as chunky as possible! But, my children prefer marinara so I don’t even bother with the meat sauce. I remember your aversion to rhubarb, but I didn’t know you didn’t like cilantro!! Now, it’s a knife to my heart 🙂 But I understand about cilantro, it’s an acquired taste and many people don’t like it. But yes, this is a very easy curry to make and I know what you mean about quick and easy. Kheema is one of my all time favourite Indian foods. My mother in law makes hers with red and green peppers in it too, cooked down till they are super soft. To me, this is comfort food. My husband used to make kheema sandwiches when his mom made it. It brings back happy memories for me.